If you are looking to fit out a staff canteen or just provide seating in the office kitchen, these beech seating units are a practical choice. 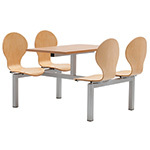 Molded seats fixed to the table create a unit that stays within its footprint, reducing the need to tidy chairs and eliminating the chance of chairs being pushed back and marking walls. The beech surface is easily cleaned and resilient to the everyday trials of canteen life.